Samsung Galaxy A7, the best metal-clad smartphone with 5.5”-inch Full HD Super AMOLED display, Qualcomm MSM8939 Snapdragon 615, Android kitkat and 13-MP+5-MP Camera finally launched in Philippines at PHP 24,990 (Approx Rs. 34,700) in Pearl White, Midnight Black, Platinum Silver, Soft Pink, Light Blue, Champagne Gold colour option which will be available soon in South Korea and Malaysia followed by other Asian countries inclduing India priced Approx Rs 30,000. Samsung recently launched new Galaxy A3 and Galaxy A5 the metal-clad smartphones in India priced at Rs. 20,500 and Rs. 25,500 respectively and new Samsung Galaxy E5 and the Galaxy E7 selfie-focused smartphone series launched priced at Rs. 19,700 and Rs. 23,000 respectively. The all new Samsung Galaxy A7 support 4G LTE, Dual-SIM(4G+3G) with Dual-SIM flexibility offers you a bigger 5.5”-inch Full HD Super AMOLED capacitive touchscreen, 16M colors display with resolutions (1080 x 1920 pixels) and Gorilla Glass 3 protection assures you wide-angle view perfect for playing games, watching movies and reading e-books. Samsung Galaxy A7 runs on Android 4.4 Kitkat OS and powered by fastest Exynos 5433 octa-core CPU (1.8GHz cortex A53 cores and 1.3GHz cortex A53 cores) with 2GB RAM perfect for enhancing your multi-tasking and enjoying your favorite apps through Google Play store. While 16GB in-built memory with 64GB expandable memory via MicroSD card slot is store house for your favorite movies, songs, games. apps and e-books. 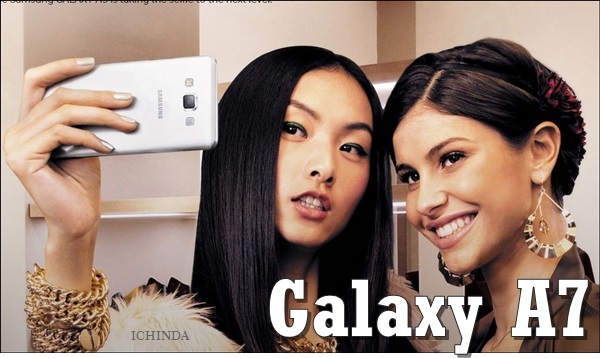 Samsung Galaxy A7 sporting a huge 13-MegaPixel Primary Camera with LED flash and Sony Exmor Rsensors to enhance your photography and 5-MegaPixel secondary camera for clicking selfies powered by a 2600mAh with Ultra Power Saving Mode, Private Mode, Multi-Screen and Quick Connect measuring 150.9 x 75.9 x 6.3 mm (5.94 x 2.99 x 0.25 in) and weight 150gm including Active noise cancellation with dedicated mic, Wi-fi, Bluetooth, USB, GPS and NFC. At last few honest word, the all new Samsung Galaxy A7 is coming to rule the smartphone market with style, speed and performance. What you think? Please be open to give your view.